The Ampney Crucis boules pitch is at the lower end of the cricket field (close to the river and the Crown of Crucis). Use is restricted to members only but membership only costs £5 per household per year. Members are welcome to play at any time, but there is a weekly Club Night during the season – details on the Notice Board by the pitch, or ring Liz Anderson on 850141. If you want to give it a try before joining, just come along on any Club Night or give Liz a ring. This gentle but competitive activity is suitable for ages. Come and give it a go! The Ampney Crucis Village Appraisal in 1999 identified the desire amongst villagers for more sports and activities to be available in the village. 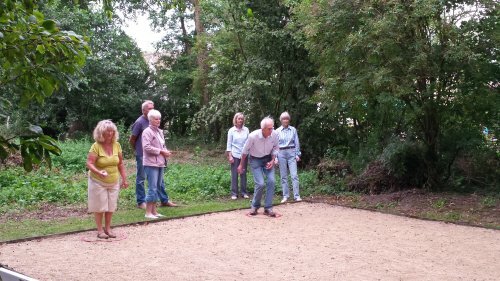 Many people expressed an interest in Boules, and it was particularly popular amongst the 45-59 age group. 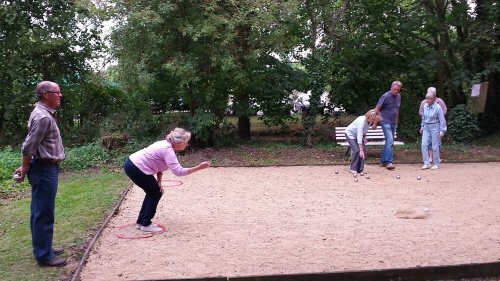 A group of villagers then formed a Pétanque Club as part of the Cricket Club using the spare land located adjacent to the pavilion. The available land is partly surrounded by mature trees and the Ampney Brook and was overgrown with nettles and weeds for most of the year. This area provided an ideal location as it is easily accessed by villagers and sufficiently remote from the cricket square to be safe and not to disturb cricket matches. Discussions with the cricket club concluded that the boule club would be a section within the Cricket club and the pitch would be available to members only for insurance purposes. However anybody could become a member of the boule section and that fees would be kept low. The cricket club agreed to waive any affiliation fee so we have been able to keep membership at £5 per household. 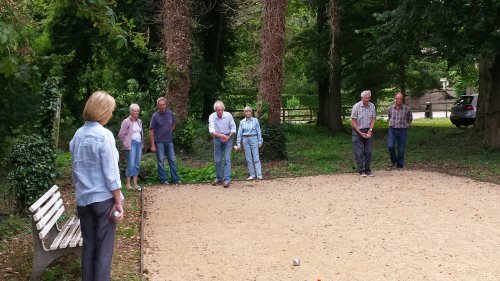 The new Ampney Crucis Pétanque Club was launched as part of the Jubilee celebrations on Monday 3 June 2002.